Giuseppe Meazza played for Italy in the 1934 and 1938 World Cups, both of which Italy won. 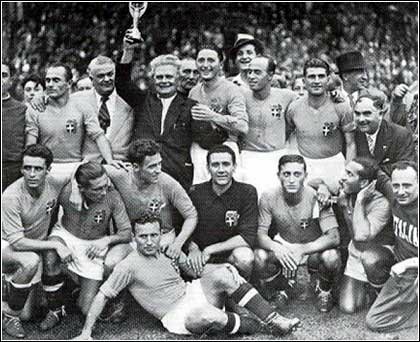 Apart from being on and captaining the first team to win a World Cup when not the host in 1938, Meazza, along with Giovanni Ferrari, Guido Masetti and Eraldo Monzeglio, also set a record for being the first players to win two World Cups (consecutive ones). Up until today, they are still the only Europeans to have achieved this record. His debut with the Azzurri was in Rome on 9 February 1930 against Switzerland. Still only nineteen years old, Meazza scored twice that game (in the 37th and 39th minutes) to help Italy to a 4–2 victory after they had been down by two goals in only 19 minutes. 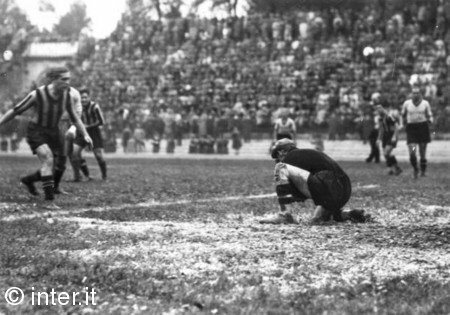 The next game Italy played was on 2 March 1930 against Germany in Frankfurt, where Meazza scored a goal in a 2–0 win. A few months later, 11 May 1930, he scored a hat-trick in a 5–0 game as Italy beat the Hungary of Larcos, Hirzer and Pál Titkos for the first time ever while playing in Budapest. Meazza helped Italy win the Dr. Gero Cup (the forerunner to the European Championship) that year, a cup was a 3 year international tournament between the strongest national teams of central and eastern Europe. 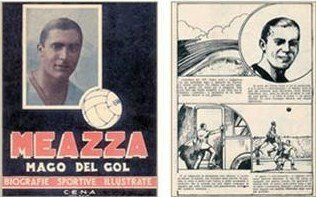 On 25 January 1931, Meazza scored another three goals in a 5–0 win against France. 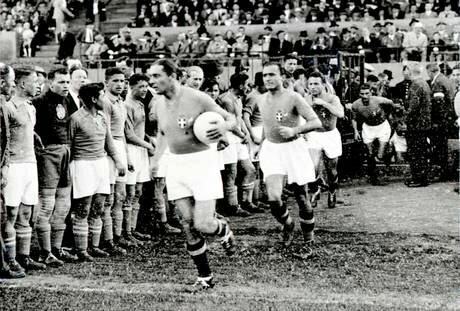 During the Dr. Gero Cup game on 22 February at the San Siro, Meazza helped Italy to victory after overcoming an early deficit when Horvath had scored in the 4th minute to beat for the first time in its history the dreaded Austria. While dribbling the ball in attack, he noticed two defenders closing down on him. He stopped the ball with the sole of his shoe, making both defenders fall to the ground, before racing towards goal, running forty yards then faking Josef Smistik, dribbling around Roman Schramseis, drawing out the keeper Rodolphe Hiden, faking and dribbling around him, making the off balance keeper crash into Schramseis, before tapping the ball into the net for the equaliser and one of the most beautiful goals in soccer history. Italy won 2–1. His first fifteen caps were at center-forward, but in 1933, he showed his versatility during a 3–1 victory over Germany in Bologna, when he was moved to an inside-right position by the Italian coach Vittorio Pozzo, to accommodate teammate Angelo Schiavio, a switch that would help Italy win the World Cup the next year as the goals flowed in. During the tournament, Meazza once again demonstrated his adaptability when he was switched to an inside-left, when needed. In the 1934 World Cup, which was hosted by Italy, Meazza appeared in every game for the Azzurri. On 25 March 1934 in Milan, Italy beat Greece 4:0 in a qualifying match with two goals coming from Meazza. He then scored the final goal in their 7–1 victory over the United States in the 89th minute in their World Cup opener. In the game against Spain, Giovanni Ferrari scored a goal against Ricardo Zamora after the latter was supposedly fouled by Meazza. Meazza was himself almost knocked unconscious by a collision of heads with Jacinto Quincoces during the game. The game ended 1–1 and had to settled the next day. Forty-three thousand screaming Italian fans witnessed Meazza score from a corner sent in by Raimundo Orsi in the 11th minute. Meazza took another nasty hit when he crashed into the desperate keeper. It was the only goal of the game. There were claims that the replacement Spanish goalkeeper, Juan José Nogués, who was replacing the injured Zamora after he was hurt in a clash with Schiavio in the first game, was fouled by Meazza in the play. However, footage exists that exonerates the Italian of any wrong doing. Meazza only ever scored one time against Zamora, in a friendly match. The semi-final was against the Wunderteam, managed by Hugo Meisl and with Josef Bican of Rapid Vienna and Matthias Sindelar of FK Austria, two of the world’s finest players, Austria was widely considered the strongest continental side and had already beaten the Italians 4–2 in Turin only four months earlier. A deluge a few hours before kick-off left the San Siro pitch resembling a bog, but Meazza, who knew this ground better than anybody on the Italian team, made light of the conditions to book his country’s place in the final. Playing his fourth game in a week, Meazza out-played an Austrian forward, dribbled past him, then collided into the grounded Austrian goalkeeper, Peter Platzer, who had pounced on the ball to quell the attack. The ball came loose, hit the post and bounced to Enrique Guaita, to score the only goal of the match. 55,000 fans turned out to see the final against Czechoslovakia in Rome’s Stadio Nazionale PNF. Italy suffered badly after Meazza was injured in a tackle. He soldiered on though. 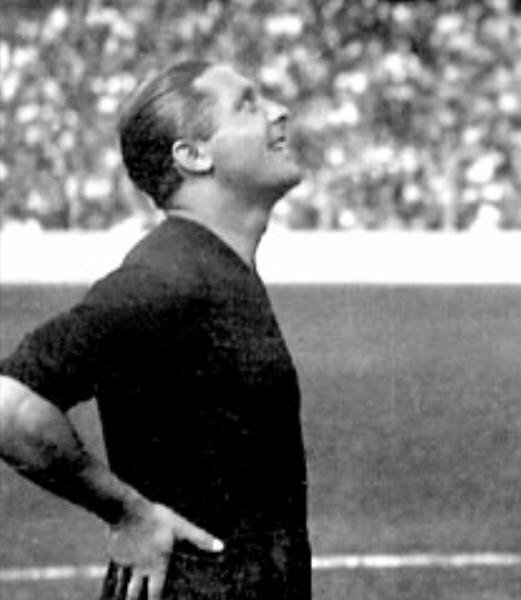 Cries of a conspiracy were heard in the 54th minute after Meazza, who was playing in the final even though carrying an injury from the semifinals, punched Rudolf Krcil in the liver in retaliation for a hard foul, without being disciplined by referee Ivan Eklind, who had also officiated the semi-final. After ninety minutes the two teams were 1–1. Italy, though, was in far more trouble as the game went into extra time, until Meazza became the inspirer again. His injury became a mixed blessing as the Czechs did not bother to mark him and he made them rue that decision. 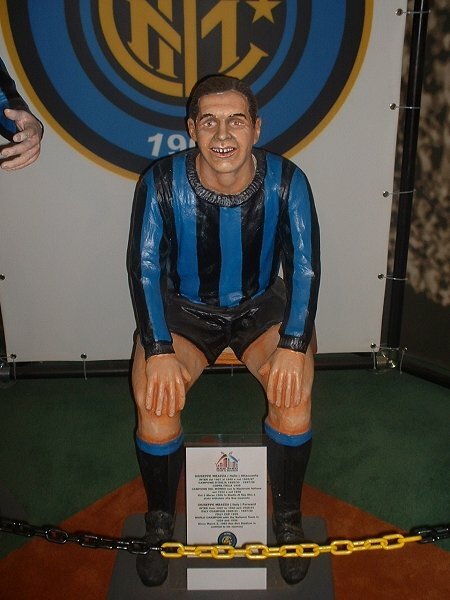 In the 96th minute, Eraldo Monzeglio sent a long ball to the hobbled Meazza from the right side of the Italian defense. Meazza, who was being left alone on the wing to drift in and out of the match, recovered sufficiently enough to send a slicing pass to Guaita that unlocked the Czech defense, and then went about setting a series of blocks to free up his strikers. The Roma midfielder slid the ball to Schiavio, who hit a snap-shot past Frantisek Planicka, another legendary goalkeeper of the era, for the winner five minutes into the extra period. Meazza was elected into the All-Star Team of the tournament and won The Golden Ball, the award presented to the best player at each FIFA World Cup finals. After the World Cup victory, Meazza represented Italy against England in the infamous “Battle of Highbury”, the Azzurri’s first game since winning the World Cup five months earlier. England and Italy had drawn, 1–1, 18 months earlier in Rome, in their only previous meeting. They game started terribly for the Azzurri. After losing Monti to a broken foot in the 2nd minute, England were leading three goals to nil by the 12th with two goals from Eric Brook and one from Ted Drake. With no substitutes allowed in those days, the Italians had to play the rest of the game with 10 men. They lost the game, however Meazza salvaged some pride by scoring two goals four minutes apart, in the 58th and 62nd minute in very heavy rain to make it 3–2. The first was the result from a skillful move by Guaita that set Meazza free to crown the straggling raid with a fine rocket shot that beat the goalie. The second on a header after he made the most of a free-kick from Attilio Ferraris. He was only denied an equalizer by the woodwork and by some fine saves by England’s goalkeeper, Frank Moss who playing in what was to be his last international. 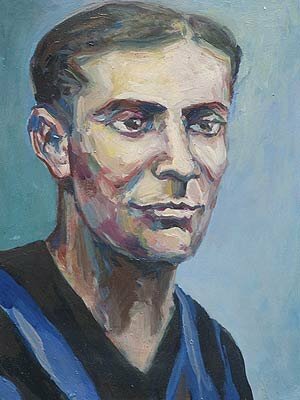 On 9 December 1934 against Hungary, Meazza scored his 25th goal (in 29 games) with the blue jersey, to tie Adolfo Baloncieri as top goalscorer for the national team. In the next game against France he had another two goals, which allowed him to jump in command of the ranking. In 1935 he claimed the Central European International Cup again. 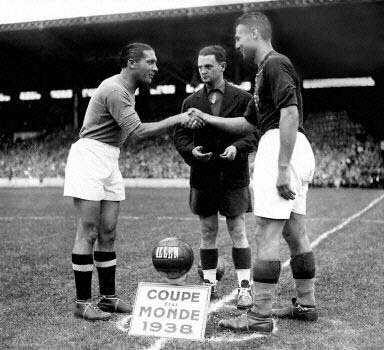 In the 1938 World Cup hosted by France, Meazza captained Italy, again playing in every match. The Italian team had extra pressure to win the World Cup. Dictator Benito Mussolini laid down the gauntlet by sending Meazza a telegram engraved with the words: “Win or die!”. After what turned out to be their toughest game of the tournament in the opener against Norway (Italy won 2–1 in extra time) Meazza petitioned Vittorio Pozzo, to allow the team a night off to relax. In his wisdom, Pozzo saw that his players needed to unwind after having trained for so long in preparation of the tournament and allowed the players a night of indulgence. Meazza was reported to have spent the night with two beautiful French girls. Another of his memorable moments in that tournament was the goal he scored against Brazil in the semi-final. Italy were awarded a penalty after Silvio Piola, the team’s new center forward, was chopped down in the box by “the Divine Master”, Domingos da Guia. 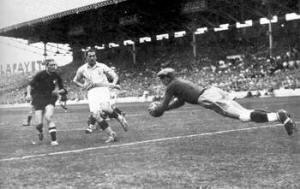 The Brazilian goalkeeper Walter, who was famous for hypnotizing his opponents and for saving penalties back in Brazil, arrogantly claimed he was certain he would save the shot. Meazza made no fuss, but as he stepped up to take the kick, his shorts fell down because the elastic around the waist had earlier been pulled and ripped by a defender. Meazza, without letting this stress him, pulled up his shorts with one hand and shot past the confused Walter, who was still busy laughing. His celebrating team-mates surrounded him until a new pair of shorts were produced. The goal sent Italy into their second consecutive World Cup final. It was his last goal for Italy. In the final, the Italians faced Hungary, a surprise package, playing a similar brand of flowing football to that of the Wunderteam. With the Italians having defeated France, home fans were well and truly behind the Magyars and hoped they could spring a surprise, but Italy’s dynamic inside-forward partnership of Meazza and Giovanni Ferrari, took hold of the game. Meazza set up goals for Silvio Piola and Gino Colaussi before halftime. The first assist he gave came after a quick exchange with Colaussi, who put Italy up 1–0. The next assist came after he faked a shot, making his defender jump past him, and dribbled past another defender, before sending in a quick pass on the ground for Piola to slam home. Ten minutes before half, after another quick exchange between Ferrari and Meazza, the latter found the unmarked Colaussi with an illuminating pass, and winger netted his second of the game to make it 3–1 at the break. After the tournament, Piola, who scored five goals in France, paid his colleague the compliment of being responsible for his own good performance: “At the FIFA World Cup, I mainly lived off Meazza and Ferrari”. He played his last match for the national nine years after his debut, on the 20 July 1939 at the Olympiastadion in Helsinki when he captained Italy to a 3–2 win over Finland. He played 53 times with Italy, losing just 6 matches and scoring 33 goals.